Spraying toxic chemical pesticides to control grasshoppers is really stupid. It doesn’t work and it’s toxic. What does work is the natural organic approach. Natural enemies of grasshoppers that would be injured with chemicals include blister beetles, ground beetles, predatory flies, parasitic flies, birds, beneficial nematodes, beneficial bacteria and beneficial fungi that inhabit healthy soil. The organic program is to plant bio-diverse gardens by using many different plants and encouraging the various insect eating animals. Birds are the most important tool of all. Put out and maintain several feeders. Biological controls such as Nosema locustae and Beauvaria bassiana can also help. The most common Nosema product is Nolo Bait and it works best early in the year when the grasshoppers are small. Build soil health and mulch bare soil. Do not mow or spray the grasses and weeds under fence lines. 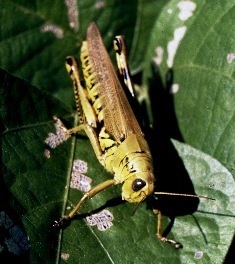 Grasshoppers need the bare soil to lay their eggs. Spray Garrett Juice mixed with 2 ounces of orange oil per gallon of spray. Add 1 quart of kaolin clay per 2 gallons of water with 1 tablespoon of Bio Wash. Adding garlic-pepper tea to the mix also helps. Pomegranates with kaolin clay application. Kaolin clay may be the best control. When mixed with water and sprayed, it forms a “particle film” on plants and confuses the pests. Research from the USDA-ARS click here indicates that it provides excellent control. Reports from my listeners corroborate these findings. Kaolin Clay for pottery making is not the same. The commercial product is called Surround WP. Surround WP doesn't kill insects but acts as a protection against insects, disease and sunburn. 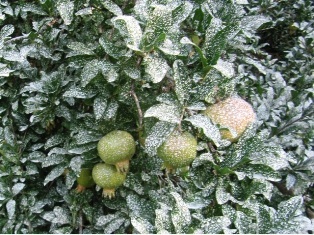 It coats the plants with a white powder film that acts in several ways to deter pests. It creates a hostile environment for insects and mites when the particles adhere to the insects acting as a strong irritant, and the film creates a physical barrier to insect pests. In addition, Surround helps prevent sunburn damage and can enhance fruit coloring. Surround is applied as a water-based slurry and needs to be applied before pests arrive. It can also be used for Japanese beetles, leaf rollers, mites, thrips, codling moths, psylla, flea beetles, leaf hoppers and other pests. My experience with the product is that it is effective with one spraying, especially if natural diatomaceous earth is added to the spray mix. The only negative is that the white particle film creates a cosmetic issue for landscaping and marketability of fruits and vegetables and lasts much longer on plants than I expected.